Prue knew that she wanted a very sophisticated vintage colour scheme that would also smell gorgeous. 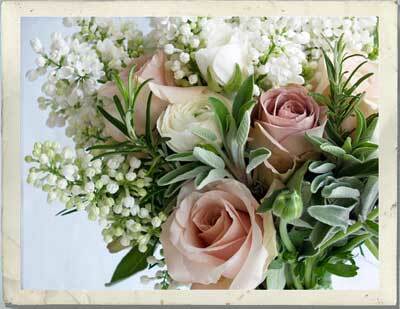 Using muted pinks with creams and whites she chose seasonal flowers and herbs with sensational scents. 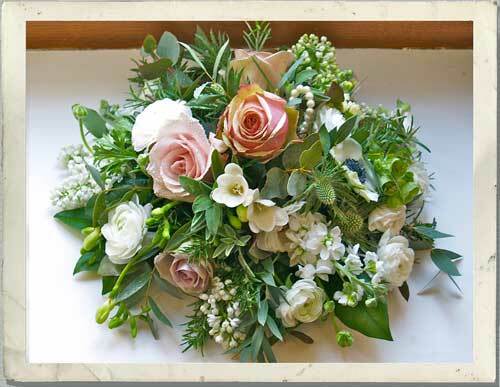 Frothy white Lilac, creamy white, heavenly perfumed Stocks all mixed together with a pinch of Rosemary and Sage and fragrant, soft, dusky pink roses. 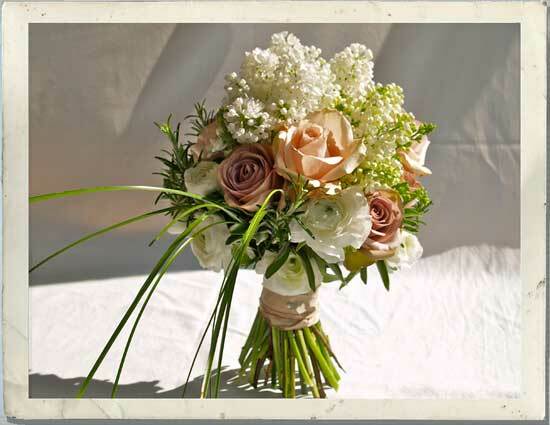 Roses are of, course so associated with weddings that they mean, "Happy Love" in general, with Soft pink ones symbolizing "Admiration" and white roses, "Innocence and Purity"
Finally, Stocks mean, "Lasting Beauty and Health". Pearly Wrist Corsages incorporating sprigs of Lilac and Rosemary with Ranunculus, Rose Buds, anemones on a bed of Ivy Leaves with Bear Grass. As Alex's family has Scottish roots, it was decided that the Buttonholes would be based around a pale grey Eryngium Thistle reflecting the National Flower of Scotland. 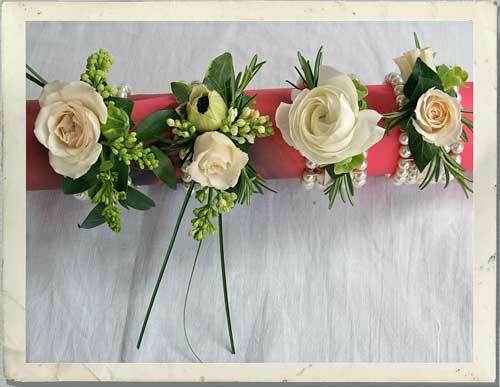 Buttonholes were made for men, boys and ladies; each one different and scented with a varying combination of sprigs of Lilac, Stocks, Freesias and Rosemary. 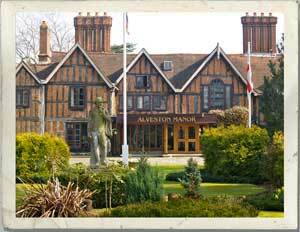 Alveston Manor, in Stratford-upon-Avon was the beautiful setting for Prue and Alex's wedding ceremony and reception. 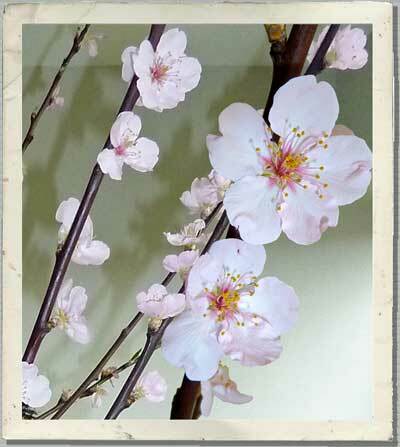 The Historic Old Hall in Shakespeare's birth place was dressed with delicate pink Prunus Blossom for the ceremony. The Registrar's table and the other table arrangements incorporated the same fragrant vintage blooms as the bride's wedding flower bouquet. 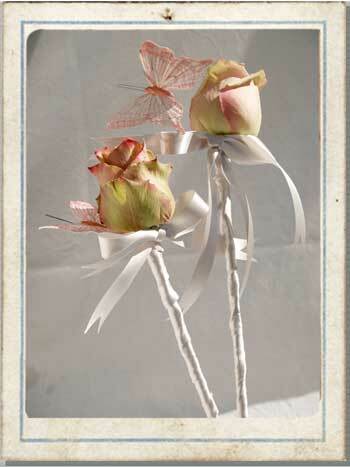 The little Flower Girls had their own special flower wands of a single "Sahara" rose and a delicate pink butterfly. 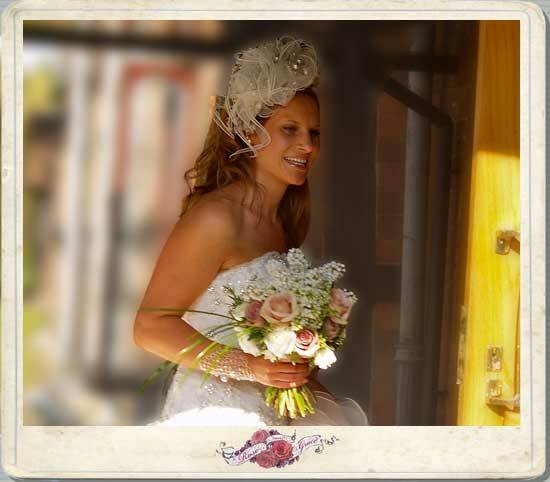 From our base in the picturesque Cotswolds, we can meet you to discuss ideas for your perfect wedding flowers wherever you find most convenient. 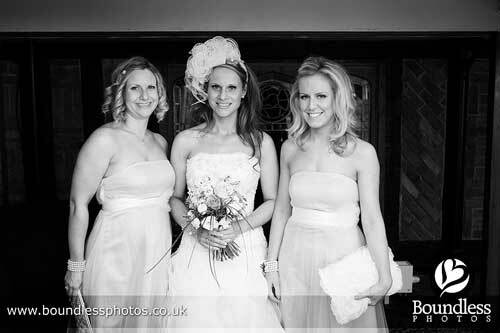 Feel free to come round to our studio to see our portfolio of wedding flowers designs and photos of flowers for special occasions. We welcome the opportunity to meet you and have a helpful and informative chat over a coffee? - just say what is best for you. Be assured, there is never any hint of a hard sell and you can come to pick our brains so that you can decide what is best for you. 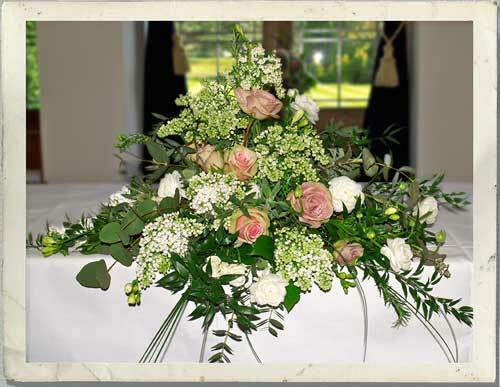 Alternatively,leave your contact details to discuss your wedding flowers ideas and we will get back to you straight away.